Pen on tracing paper, Fabriano ( cover ), sewing thread, engraved magnifying glass. Open format: 130 x 100 cm. Artist as Traveller Seminar, Kings House, Boyle, Co Roscommon. Trunk Show, Travelling exhibition, Roscommon, West Cork, London. Curators, Cliodhna Shaffrey & Ann Shostrom. Temporary Locations is a drawing that employs the language of cartography to map both physical and liminal landscapes. Commissioned for the Artist as Traveller seminar and the Trunk Show travelling exhibition, the work combines actual topographical data, Aer Lingus flight routes from Ireland and emotive responses to the drumlin landscape of North Leitrim. 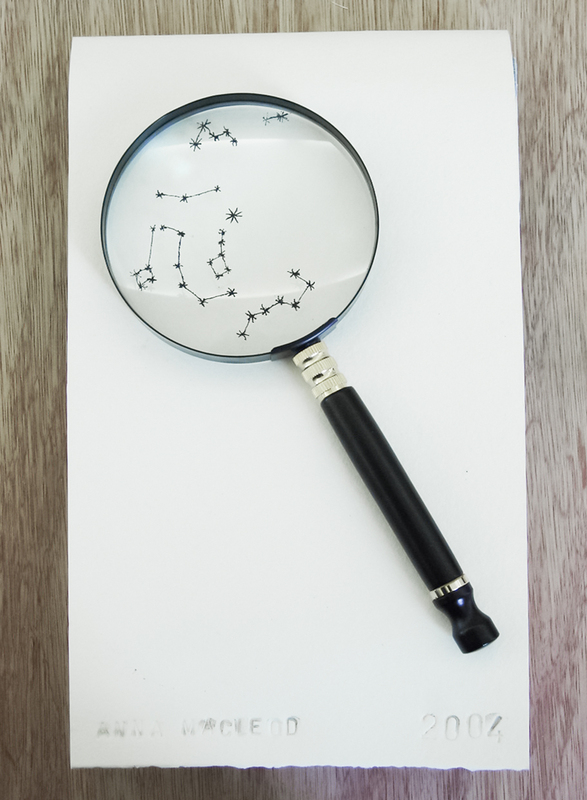 The magnifying glass viewfinder is engraved with a section of the Northern hemisphere star map.